↑ Chan, Kam Wing (2007). "Misconceptions and Complexities in the Study of China's Cities: Definitions, Statistics, and Implications". Eurasian Geography and Economics খণ্ড 48 (4): 383–412. doi:10.2747/1538-7216.48.4.383. http://courses.washington.edu/chinageo/ChanCityDefinitionsEGE2007.pdf। আহৰণ কৰা হৈছে: 13 September 2011. , p. 395. ↑ "What are China's largest and richest cities?". University of Southern California. http://china.usc.edu/(S(swqn0p55xbqmsu45cwso5lzy)A(IEcheuFczAEkAAAAODRlNTk2OTMtMDViMC00Yjk5LWFmZTgtODc1OTA1YWYxMDM4e9e8O7-g5_HYhuft0Huy7h2GlGg1))/ShowAverageDay.aspx?articleID=910. ↑ "Cities: largest (without surrounding suburban areas)". Geohive. http://www.geohive.com/earth/cy_notagg.aspx। আহৰণ কৰা হৈছে: 13 September 2011. ↑ "The Competitive Position of London as a Global Financial Centre". http://www.zyen.com/PDF/LCGFC.pdf. ↑ "Top 50 World Container Ports". http://www.worldshipping.org/about-the-industry/global-trade/top-50-world-container-ports/. ↑ "Geographic Location". Basic Facts. Shanghai Municipal Government. http://www.shanghai.gov.cn/shanghai/node23919/node24059/node24061/userobject22ai36489.html। আহৰণ কৰা হৈছে: 14 September 2011. ↑ Scott Tong (October 2009). "Shanghai: Global financial center? Aspirations and reality, and implications for Hong Kong". Hong Kong Journal. http://www.hkjournal.org/PDF/2009_winter/3.pdf। আহৰণ কৰা হৈছে: 17 October 2011. ↑ "Historic Transformation". Shanghai.gov.cn. 27 May 1949. http://www.shanghai.gov.cn/shanghai/node17256/node17432/node17433/userobject22ai24.html। আহৰণ কৰা হৈছে: 11 December 2011. ↑ Hunt, Katie (21 May 2008). "Shanghai: China's capitalist showpiece". BBC News. http://news.bbc.co.uk/2/hi/business/7373394.stm। আহৰণ কৰা হৈছে: 7 August 2008. ↑ "Of Shanghai... and Suzhou". The Hindu Business Line. 27 January 2003. Archived from the original on 23 May 2009. http://web.archive.org/web/20050819054503/http://www.thehindubusinessline.com/life/2003/01/27/stories/2003012700170300.htm। আহৰণ কৰা হৈছে: 20 March 2008. Danielson, Eric N. (2010). Discover Shanghai. প্ৰকাশক Singapore: Marshall Cavendish. Danielson, Eric N. (2004). Shanghai and the Yangzi Delta. প্ৰকাশক Singapore: Marshall Cavendish/Times Editions. ISBN 981-232-597-2. Elvin, Mark (1977). 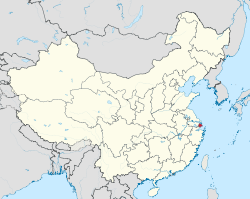 "Market Towns and Waterways: The County of Shang-hai from 1480 to 1910". In Skinner, G. William. The City in Late Imperial China. প্ৰকাশক Stanford, Cal. : Stanford University Press. পৃষ্ঠা. 441–474. ISBN 9780804708920. OCLC 2883862. https://books.google.com/books?id=cZuaAAAAIAAJ&pg=PA441#v=twopage&q&f=false. Erh, Deke and Johnston, Tess (2007). Shanghai Art Deco. প্ৰকাশক Hong Kong: Old China Hand Press. Horesh, Niv (2009). Shanghai's Bund and Beyond. প্ৰকাশক New Haven: Yale University Press. Johnson, Linda Cooke (1995). Shanghai: From Market Town to Treaty Port. প্ৰকাশক Stanford: Stanford University Press. Johnson, Linda Cooke (1993). Cities of Jiangnan in Late Imperial China. প্ৰকাশক Albany: State University of New York (SUNY). ISBN 0-7914-1424-8.